My trusty Dodge Ram 1500 has been sold. I bought it mainly for hauling supplies to the tiny house. There is much less need for that these days since it's really down to smaller tasks at this point. 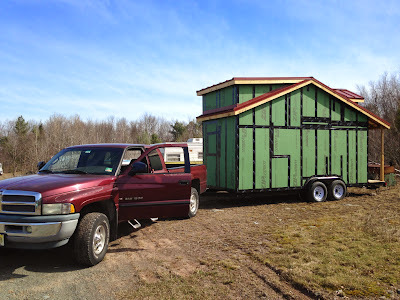 The truck did tow the tiny house for about 20 miles when I retrieved it early on from a storage facility I dropped it off at, post cross country trek. The truck struggled immensely with the weight of what was just the shell at that point. It clearly was not up to the task of longer towing excursions. I bought the truck on Craigslist and sold it on Ebay. It's hard to find a good truck. Most of them have some sort of issue and if you are in a high mileage bracket (as this one was), you run the risk that anything could go wrong at any time. Anyway, I'm glad it's gone...but will miss it a wee bit.